Endocrine therapy (ET) used to reduce the risk of recurrence in hormone receptor-expressing disease (75% of breast cancers) is associated with worsening of climacteric symptoms with a negative impact on quality of life (QoL). Homeopathy might allow a better management of hot flushes (HF). 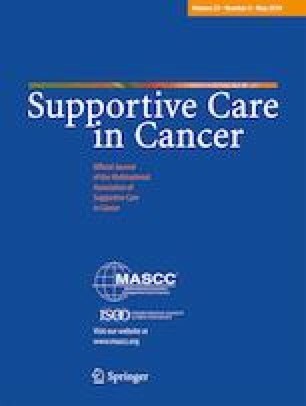 In this multicenter randomized double-blind placebo-controlled phase III study (ClinicalTrials.gov NCT01246427), we enrolled ≥ 18 years old women with histologically proven non metastatic localized breast cancer, with Eastern Cooperative Oncology Group-Performance Status (ECOG-PS) ≤ 1, treated for at least 1 month with adjuvant ET, and complaining about moderate to severe HF. Patients should not be scheduled for chemotherapy or radiotherapy, and had no associated pathology known to induce HF. After a 2- to 4-week placebo administration, we randomly assigned (1:1) patients with HFS ≥ 10 using an interactive web-based centralized platform to BRN-01 homeopathic medicine complex (Actheane®) in arm A or Placebo (Arm P). Randomization was stratified by adjuvant ET (taxoxifen/aromatase inhibitor) and recruiting site. HF scores (HFS) were calculated as the mean of HF frequencies before randomization, at 4, and at 8 weeks post-randomization (pre-, 4w,- and 8w-) weighted by a 4-level intensity scale. Primary endpoint was assessed at 4-week post-randomization, as the variation between pre- and 4w-HFS. Secondary endpoints included HFS variation between pre- and 8w-HFS, compliance and tolerance assessed 8 weeks after randomization, and QoL and satisfaction assessed at 4- and 8-week post-randomization. Two hundred ninety-nine patients were included, and 138 (46.2%) randomized (A, 65; P, 73). Median 4w-HFS absolute variation (A, − 2.9; P, − 2.5 points, p = 0.756) and relative decrease (A, − 17%; P, − 15%, p = 0.629) were not statistically different. However, 4w-HFS decreased for 46 (75%) in A vs 48 (68%) patients in P arm. 4w-QoL was stable or improved for respectively 43 (72%) vs 51 (74%) patients (p = 0.470). The efficacy endpoint was not reached, and BRN-01 administration was not demonstrated as an efficient treatment to alleviate HF symptoms due to adjuvant ET in breast cancer patients. However, the study drug administration led to decreased HFS with a positive impact on QoL. Without any recommended treatment to treat or alleviate the HF-related disabling symptoms, Actheane® could be a promising option, providing an interesting support for better adherence to ET, thereby reducing the risk of recurrence with a good tolerance profile. The online version of this article ( https://doi.org/10.1007/s00520-018-4449-x) contains supplementary material, which is available to authorized users. The authors would like to thank the patients, staff at each study site, and all active investigators for their participation in the study (Online resource 1). We thank Sophie Darnis for medical editorial assistance with this report. PEH, JPG, DP contributed to the trial conception and design. PEH, IVPD, BV, IC, ACHB, JPJ, LS, LV, DD, and JPG contributed to data collection. EL did the statistical analysis and contributed together with EB, PEH, JPG, and DP to data analysis and interpretation. AB and EB were involved in quality control of data and algorithms. PEH, JPG, and DP supervised the study. All authors reviewed the report for intellectual content, provided comments, and gave final approval for publication. Laboratoires Boiron provided the study drug Actheane® and its matching placebo, and funds to the sponsor to conduct this study. Laboratoires Boiron had no role in study design, data collection, data analysis, data interpretation, nor writing of the report. An informed consent was obtained from all individual participants included in the study.